Create navigation points. 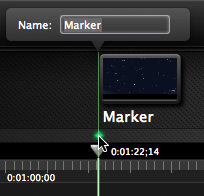 If you export your video with a table of contents, the markers appear as table of contents entries in the final video. Mark editing points such as mistakes during recording, portions of the recording to cut out, etc. 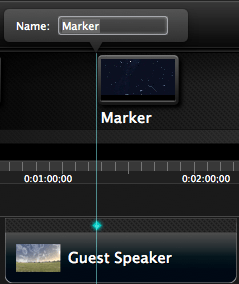 When you record a PowerPoint or Keynote presentation, Camtasia automatically creates markers on the timeline for each slide. Global markers appear as green diamonds on the marker track on the timeline. When you move media on the timeline, global markers maintain their position on the timeline. Select View > Show Marker Track. Click above the playhead within the marker track, or press Option-M. Enter a marker name. If you include a table of contents when you export a video, the marker names appear as the table of contents entries within the video. Media-based markers appear as teal diamonds attached to media on the timeline. When you move the media on the timeline, media-based markers maintain their position within the media. Click above the media to add a marker.